Apologies to anyone who is fed up with me posting pictures of Cockatoos but I wanted to share this one. 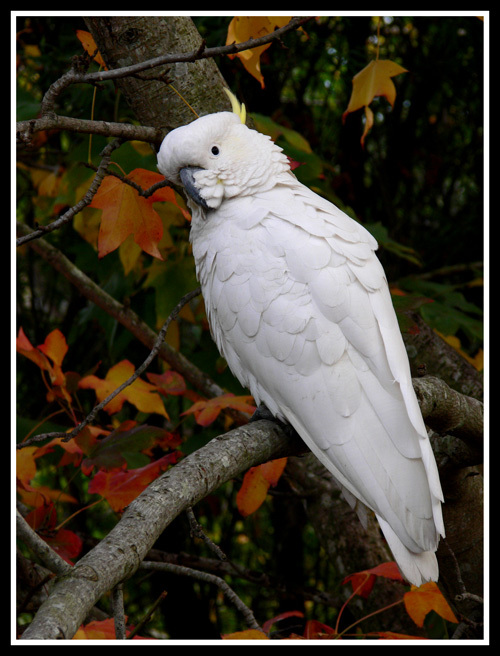 Winter is almost here down under and I thought the colours of the leaves were a good contrast to the white of the bird. Well done - cockies can be cantankerous when they don't want to be photographed. I remember chasing yellow tailed black ones in tasmania for hours and the best shot I got looked like the UFO poster on Mulder's wall in the X Files. Excellent photo. The bird really stands out against its nice background.